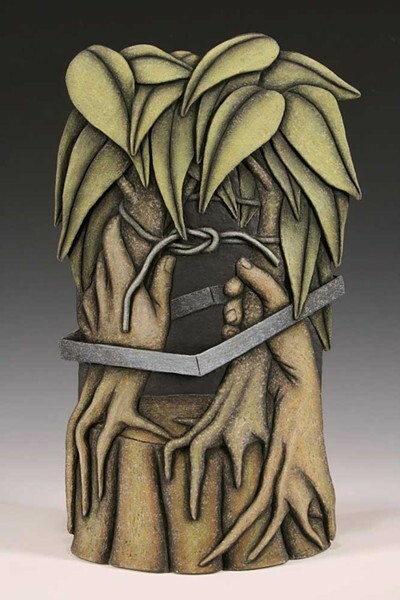 Photo courtesy of the artist Louis Marak's 2007 earthenware "Square Root of Tree." Photo courtesy of the artist Untitled, by Jason Marak. "Duets," opening this month at Piante Gallery, presents some memorable examples of the way words and pictures can brush against each other to strike sparks. For the show, gallery director Sue Natzler got in touch with 15 pairs of visual artists and writers who are either Humboldt-based or linked, proposing that they collaborate. Some artists and writers were strangers at the outset; others were linked by a longstanding friendship, like that of Becky Evans and Jerry Martien, and two others — Louis Marak and his son Jason Marak — by blood relations. For Martien and Evans, thinking about this project led downstream on parallel paths. Martien is the author of books in poetry and prose that connect to place on multiple levels; Evans makes art of and about the land, using naturally sourced materials that have included sod, mud, beaver-gnawed sticks, surf balls and potato chips. The artists have certain things in common, like a Southern California childhood and a move to Humboldt County that turned out to be pivotal; they love the wild rivers of the region and remain fascinated by the way those cold, fast-moving streams have been exploited as conduits of power. Growing up, both experienced the state's geography as a riparian flow along U.S. Highway 101. Traffic's bidirectional flow doubled the flow of water, which was only pumped one-way. The prose poem that Martien completed for this exhibition, "water and power," sketches an episodic history of California rivers. It sweeps fluently from personal histories to larger ones, revealing how both are shaped in relation to prevailing currents. When read aloud, it unspools in long, racy left-justified lines that rise and fall like voices overheard in conversation, each paragraph/stanza initiating with the verb "flows," to ekphrastic effect. If you look aslant, the stanza breaks resemble rapids; if you squint, a rainbow prism might focus the river's spume. Marilyn Andrews, whose work often addresses the relation of text and image, is showing works on paper that layer handwritten text in different calligraphic hands, from Hebrew script to block capitals to an elegant copperplate cursive — palimpsest notations that tumble forth on the page the way thoughts will in the idle mind. Her reliefs juxtapose relics of analog-age manual labor like spindles, vises, bits of hardware and old tools, celebrating the bluntly Bauhaus principle of functional form while accentuating the considerable allure those solid objects now radiate in a de-skilled labor economy where interactions with computers have largely replaced ones with things. Andrews' "Mezuzah" is both artwork and devotional object: a goatskin parchment scroll inscribed with a passage from the Book of Deuteronomy and furled in a bespoke case that hangs on the wall at a cant reprising a mezuzah's traditional angled placement on the doorpost of a Jewish household. A group of ceramic figurines titled "Muses" looks like glossy lengths of ceramic pipe, snow white, unarticulated forms like plumbing fixtures or straps of albino licorice, faceless like the bladelike figures the early Minoans carved in marble. 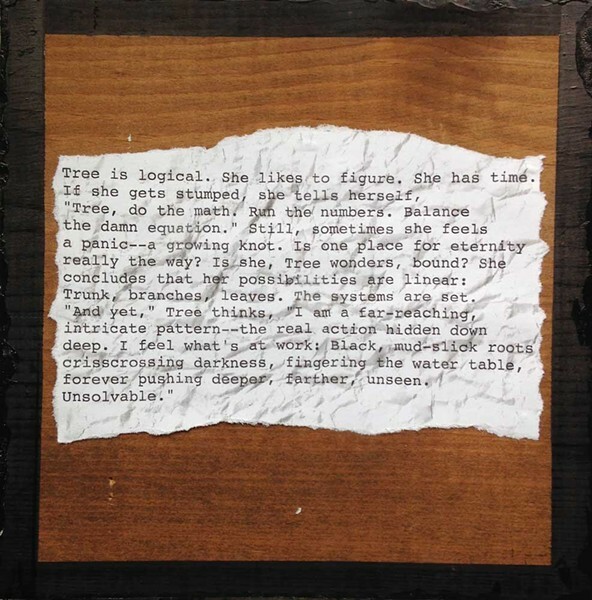 While some pairs collaborated from beginning to end, Jason Marak wrote the short story on view in response to "Square Root of Tree," a ceramic sculpture made in 2007 by his father, Louis Marak, professor emeritus of ceramics at Humboldt State University. "In doing this, I realized how certain elements of surrealism or magical realism that had been important in my own work had come from him," Jason Marak observed. "Growing up with his work around me, certain things rubbed off: the juxtaposition of words in titles, the way the work prompts you to reconsider everyday objects or moments." Jason Marak writes mostly poetry and fiction. The piece he contributes here, like many of the ones he's been working on lately, takes the highly disciplined form of the 100-word short story. "These stories might start out much longer," he explained, "but they get condensed." The process can be quasi-culinary. "It's like cooking a sauce, or a roux: when you reduce it, the flavor gets stronger." He says working with that restriction "has forced me to come to some (artistic) decisions I would never have arrived at otherwise." Jason Marak's untitled story, typewritten on a piece of crumpled paper affixed to plywood, takes his father's koan-like title as a starting point and bends its implications in some surprising new directions. "Duets" will be on view through June and July at Piante Gallery, 620 Second Street, Old Town Eureka. An opening reception will be held on Friday, June 7 in conjunction with Arts Alive. Readings by participating writers will take place on June 7 and July 12. Details available at www.piantegallery.com. Editor's note: In the interest of full disclosure, Jason Marak is the spouse of Journal arts and features editor Jennifer Fumiko Cahill. Consequently, this piece was edited by assistant editor Kimberly Wear.